I had lots of fun in the kitchen this weekend! The following treats were enjoyed by trick-or-treaters of all ages! Breakfast is a meal my husband and I don't change up much. My husband normally cooks breakfast and it's always wonderful. He makes the best cheese eggs! We have our favorite breakfast casserole, biscuits and gravy, ham and eggs and the Bradford Inn waffles w/fruit syrup I recently blogged about. Well, today I ventured our of our comfort zone and made something new and it was amazing. My husband and I have added it to our list of breakfast favorites. These amazing Oatmeal Pancakes with Banana-Walnut Syrup comes to you via the Betty Crocker BEST Bisquick RECIPES cookbook. stirring occasionally, until walnuts and butter just begin to brown. ingredients with wire whisk or fork until blended. batter onto hot griddle. Cook until edges are dry. Turn, cook other sides until golden brown. Today we had a carry in after parent/teacher conferences. I had to come up with something quick and easy to make because I didn't have much time by the time I left school at 8:00 p.m. the night before, traveled to the grocery store ... then return to school the next morning at 8:00 a.m. I put all of the following ingredients in the crock pot before leaving home, then plugged it in at school, stirring occasionally. Presto...it was ready to take to the carry-in. It was good stuff! Microwave all ingredients in microwaveable bowl on HIGH 5 min. or until VELVEETA is completely melted and mixture is well blended, stirring after 3 min. I made this in the crock pot. 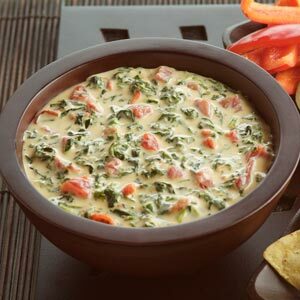 Best if you keep dip warm while serving. Several years ago my sister, Debbie and I purchased these special baking pans called tiara pans. Duncan Hines cake mixes were selling them as a set...cake mix/pan. The pan has a fluted edge with a hollow center for fillings. My sister and I created our own recipe out of a favorite brownie recipe we had always used and cherry pie filling as the topping. It makes a pretty dessert! I had not made one of these Cherry Brownies (that's what we have always called this dessert.) for a very long time. I asked my daughter recently what cake she wanted for her birthday...She ordered the Cherry Brownie. 1/2 cup pecans or walnuts (optional)...* I don't include. Mix all of the above together. Pour into a tiara pan, which has been greased and floured. Bake at 375 degrees F. for 25 minutes. When cool, invert pan onto a serving plate. Pour a can of cherry pie filling in the center. 1. Line a large baking sheet with nonstick foil or parchment paper. 2. Wash and thoroughly dry apples; remove stems. Insert popsicle sticks into stem ends. 3. Combine sugar, corn syrup and water in a medium saucepan over medium-high heat; stir until sugar dissolves. Attach a candy thermometer to side of pan. Continue to cook, without stirring, until mixture reaches 250 degrees F (wipe down sides of pan with a wet pastry brush occasionally to prevent crystallization). 4. When mixture reaches 250 degrees F, add cinnamon candies and stir just to blend. Continue to cook until 300 degrees F, about 15 to 20 minutes. Remove syrup from heat and swirl in food color, tilting saucepan, until blended. Let mixture settle for a minute until bubbles slow down. 5. Holding an apple by the popsicle stick and tilting pan, dip and swirl apple until coated. Lift apple and gently twirl over saucepan, letting excess drip back into pan. Place on prepared baking sheet, popsicle stick up. Repeat with remaining apples. 6. Allow apples to stand at room temperature until candy coating hardens, about 1 hour. 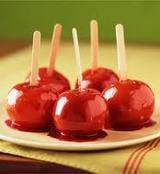 Candy apples can be made up to 1 day ahead and stored at room temperature. I've been making this soup for awhile and I adore it! Number one...it couldn't be any easier and number two....it has the best taste without the addition of any spices. You can add salt and pepper to taste, but it is not necessary unless you are passionate about those two things. My friend, LeeAnn, brought this soup to a carry-in at my house approximately 5 years ago. It was one of those memorable moments where you just had to have the recipe as soon as you took the first bite. LeeAnn recently told me that this was a Weight Watcher's recipe. Well are you ready? It won't take long to write this one down or make it. Savor every bite! 2 cans minestrone soup, plus one can water. Combine all ingredients and warm. Great with tortilla chips or fritos. Southern ranch beans can be hard to find in stores... the well-known WM chain always has them. Source: Thanks LeeAnn Collier and Weight Watchers! My son and his family moved to a new house this past weekend. For a meal one evening I fixed up some pulled pork, cole slaw, chips/dip and brownies. In this post I'm sharing "Spicy Pulled Pork" from The Pioneer Woman Cooks cookbook. I keep going back to this delightful cookbook for recipe after recipe. When you discover something good...you continue to use it...that's what this Missouri farm chick says! In a food processor, combine the onion, chili powder, brown sugar, garlic, oregano, cumin, salt, pepper, olive oil and vinegar. Pulse until totally combined. Pour the mixture over the pork. Rub it into every nook and cranny of the meat, tucking it under folds and in crevices. Place the pork into a roasting pan or Dutch oven and add 2 cups water. Cover tightly and roast for 6 to 7 hours, turning once every hour. Check to make sure it's fork tender. Increase the heat to 425 degrees F and roast uncovered for 20 minutes, or until the skin gets crispy. Remove from the oven and allow the pork to rest for 15 minutes. Shred the meat, using two forks to pull it apart. Place the shredded meat on a large platter lined with lime wedges. Pour the pan juices over the shredded meat. This will ensure that the meat stays extra tender. I made this in a crock pot instead. Instead of serving on tortillas...I served them on wheat and onion rolls... with barbecue sauce. Source: Drummond, Ree. "Spicy Pulled Pork," Recipe. The Pioneer Woman Cooks. New York: William Marrow, 2009. 94-95. So I was planning to make an apple pie when I got home from school today, instead I made an apple galette. When I discovered this recipe in one of our kid's cookbooks in our school library I thought..."big kids can make things from a little kid's cookbook." A side-note...we can't keep cookbooks on our library shelves - boys and girls can't get their hands on enough. I love that children are showing an interest in cooking too! Back to the apple galette I made today... I didn't know what a galette was so I did some research and I learned...Galette is a french word meaning various types of flat, round or free form crusty cakes. The term galette is usually applied to pastries best described as large cookies. 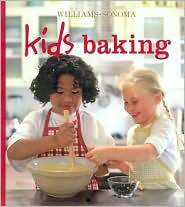 Here is the recipe I discovered in Williams-Sonoma Kid's Baking.. Please keep in mind that the recipes in this book are very detailed and the audience is children of all ages. This kid's cookbook even includes a list of tools to use. I did not cook a thing today! Instead, I cleaned the refrigerator, organized the pantry and washed all the canisters. Now I can make a mess tomorrow. I'm cooking some of my daughter's favorite things for her 28th. A friend asked me today if I had a chicken pot pie recipe I might share with him. As a result, I'm sharing it with all my blog friends. Luckily, I have some pictures to share with you too. I received this easy chicken pie recipe from a teacher friend not too long ago. Enjoy! Cook butter, onion and celery in a skillet. Cook on low/medium heat until vegetables are tender. Cook one chicken breast and chop fine. In a bowl, whip cream of chicken soup and chicken broth. Add chicken. Steam 1 pkg. mixed vegetables and mushrooms. Add butter/onion/celery. Salt and pepper to taste. Pour mixture into pie crust, top with second crust, vent and bake at 350 degrees F for 1 hour. The new vegetable steamers with corn, carrots and green beans are preferred. I haven't posted a recipe from another blog yet ...but I just had to do just that for this Easy Apple Cake. And...YES - it is easy to make and eat. Occasionally, you find a recipe that is unforgettable...this cake is one of those recipes. Think about apples, dates and walnuts all in one cake and you will get a delicious result. Bakerella is just one of many blogs I follow (see blog list in the right-hand column). My mom and grandmother would say..."What is a blog?" and I would answer "an online cookbook of ideas, pictures and food." What will future generations have as a source of ideas, pictures and recipes? One only knows. Make this cake and I will guarantee you...you will love it. It's best kept in the refrigerator... and I haven't yet, but next time I'm going to leave the topping off - not that my husband and I don't love it with the topping, but we want to taste this cake without it. Here are a few pictures of the process. See the recipe link below the photographs.